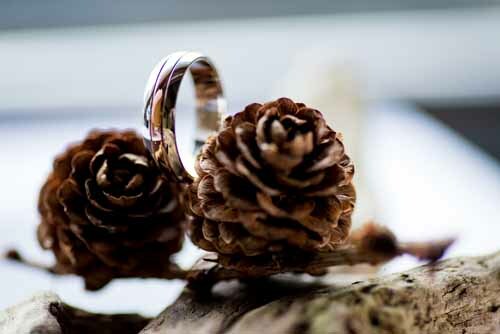 The wedding ring is the last present a couple will give one another before they are married and therefore is really special as you will wear it every day for the rest of your life and then it will be passed down as an heirloom you will pass on to one of your children or grandchildren. At Hilser Bros. we have a complete collection of wedding bands both diamond set and plain, which are available in a range of precious metals, widths and weights. Today, many women are choosing diamond set wedding bands to compliment their engagement rings. We also offer a design service so you can have a wedding band custom made if you can’t find your ideal ring in one of our collections. If you have inherited a ring, our jeweller can incorporate it into a new design so you can cherish the memory of that special person forever. All rings can be personalised with engraving or why not have your fingerprint embedded on your partners ring. In addition Hilser Bros. Jewellers offers all of its wedding couples a beautiful coin to commemorate their special day and we will polish your engagement ring to ensure it is sparkling on the day. Call into us today to find out more.